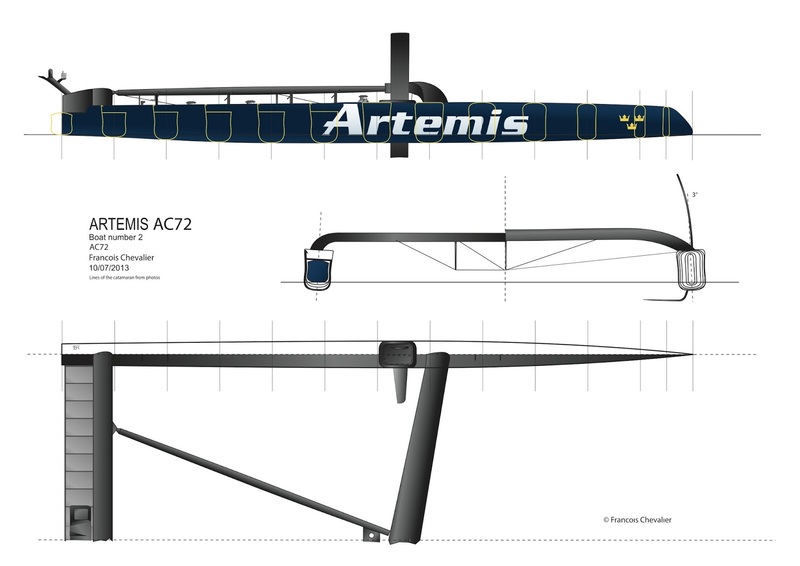 Since July 9th, 2013, it has been possible to discern the platform of the second Artemis Racing AC72, the Swedish challenger. Once again Artemis designer Juan Kouyoumdjian has designed a fairly special AC72. He has promoted lightness and simplicity, and the hull lines are very sophisticated in their pear shape. Thank you for allowing a small group of journalists to watch this outing in the yard with even the sacrosanct foils, still in their box, unveiled to satisfy the visitor's curiosity. This drawing is a first sketch! Of course we will complete these drawings when this catamaran is fully fitted. François and Jacques wish to thank Robert and Greg (CupInfo) for their assistance.